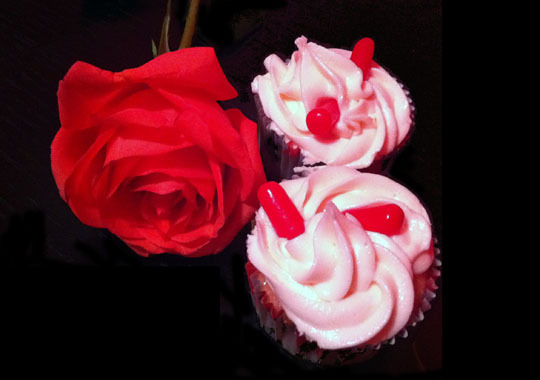 My Valentine requested cupcakes with Red Hots, but there were none to be found. Really… Was there a run on Red Hots in Brooklyn? 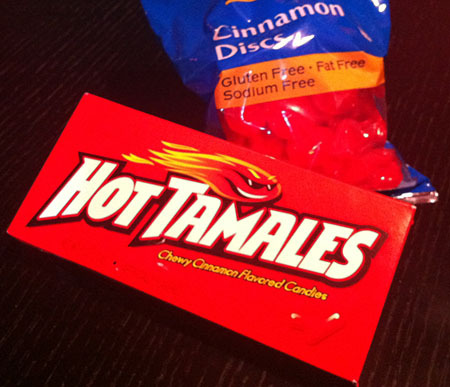 I had to switch gears, so I purchased a store-brand bag of cinnamon discs (individually wrapped hard candies) and a box of Hot Tamales! 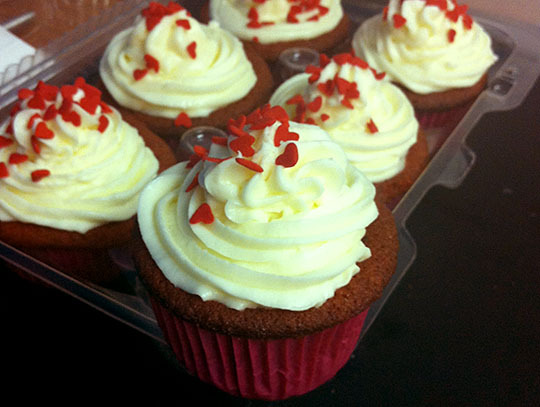 How to get the “hot” flavor in the cupcakes? I just didn’t know what to expect if I put Hot Tamales in the batter, so I went another route. I crushed cinnamon discs in a baggie with a hammer (now that’s what I call fun!) and used them instead of about half the sugar in my vanilla cupcake recipe. I put the crushed cinnamon discs in with the sugar and butter when creaming, then proceeded as normal. The candy powder and pieces were not melding with the rest, so I let the batter sit about an hour before giving it a last mix and scooping it into the tins to bake. The time I let pass allowed the color and flavor of “cinnamon” seep into the batter for a more cohesive look and taste. Then for the frosting… I was avoiding using any real cinnamon in these cupcakes, as I wanted to get the real fake taste of “red hot” candy right! I opened up my box of Hot Tamales with an idea. Once I had piped frosting on the cooled cakes, I added—finally—two Hot Tamales. 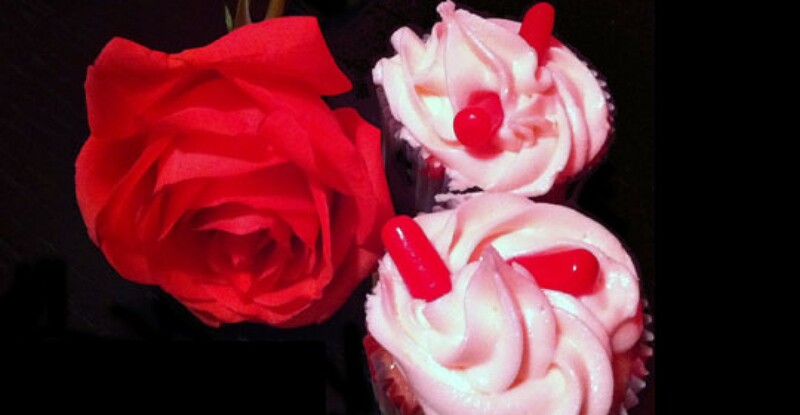 I served the cupcakes to my Valentine (and me!) with scoops of vanilla ice cream. Some lucky Webgrrls enjoyed the extra cupcakes at a workshop the next evening! They did not taste terribly spicy, but they had a little of that red-hot kick, I’d say. I’ll let my tasters comment! 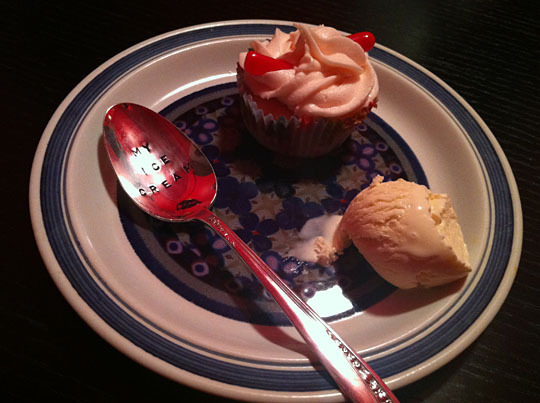 *This lovely hand-stamped vintage spoon, part of a pair (the other says “Your Ice Cream”), is from Beach House Living.